There are not many days that go by in which former San Francisco 49ers quarterback Colin Kaepernick’s name does not get mentioned in NFL news. The Friday before Super Bowl LIII is no different. TMZ Sports caught up with former 49ers coach Chip Kelly who had nothing but positive things to say when asked about Kaepernick playing in the league again. 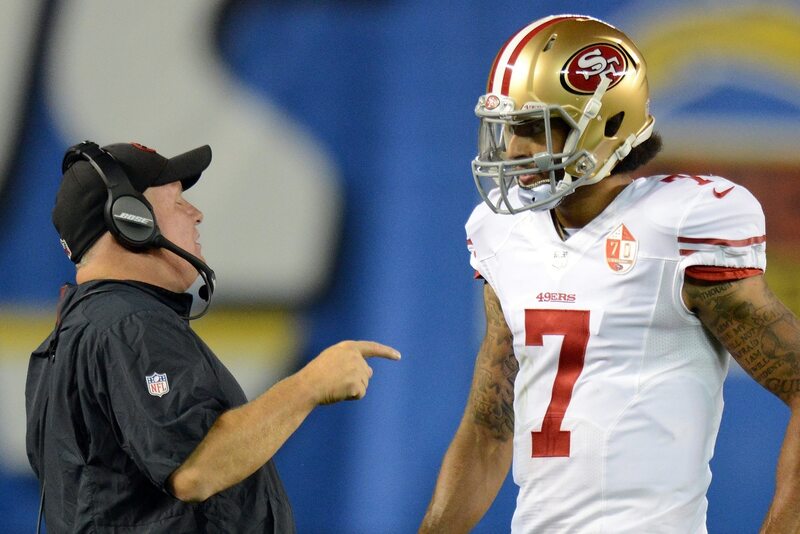 The last time Kaepernick suited up professionally in the league was in 2016 when Kelly was his head coach. Following the end of that season, Kaepernick was released by the 49ers. Since then, Kaepernick has drawn interest from a few franchises, but nothing has come about. He is currently engaged in a lawsuit with the NFL claiming the league and the 32 owners are colluding against him. This particularly relates to Kaepernick being unable to find work in the NFL after he took to kneeling during the National Anthem in 2016. As free agency once again begins to approach, it will be interesting to see if teams in need of quarterback depth will give any consideration to Kaepernick. Clearly, we have already seen examples of franchises that need quarterbacks, literally digging at the bottom of the free agent barrel. Soon enough, we will find out if Kelly’s comments about his former quarterback fall upon deaf or listening ears.